Bienvenue à notre escapade à la plage au Turquoise Place. Notre condo est la chambre numéro 2405 située au 24ème étage du bâtiment C. Nous sommes heureux de partager notre "chez-soi loin de chez soi" et espérons que vous l'aimerez autant que nous. Turquoise Place 2405C est un 3 chambres, 3, 5 salles de bains unité Gulf-front avec accès à un balcon privé depuis le salon et la chambre principale. Détendez-vous et profitez de la vue imprenable depuis votre bain à remous privé situé sur votre balcon donnant directement sur le golfe. Ce balcon spacieux est également équipé d'un barbecue à gaz. La spacieuse chambre principale a un lit King et la salle de bain principale est équipée d'un bain à remous et d'une douche séparée. La deuxième chambre a un lit King et la troisième chambre a deux lits doubles. La magnifique pièce à vivre comprend un canapé-lit pouvant accueillir 10 personnes au total. Votre cuisine entièrement équipée comprend des plans de travail en granit, un réfrigérateur Sub Zero et un refroidisseur à vin. Situé sur 900 pieds d'une plage de sable blanc immaculée à Orange Beach, en Alabama, le Turquoise Place est connu comme la propriété Premiere de la côte du golfe. Également au-dessus de la concurrence, Turquoise Place offre une vue panoramique sur l’île exclusive d’Ono et sur les plages environnantes d’Orange Beach, de Gulf Shores et de Perdido Key. Ce balcon spacieux est également équipé d'un gril à gaz pour votre plaisir de cuisiner. Votre cuisine entièrement équipée comprend des comptoirs en granit, des appareils Wolf, un réfrigérateur Sub Zero et un refroidisseur de vin. N'oubliez pas d'apporter votre ordinateur portable car nous offrons le WiFi GRATUIT! Turquoise Place Resort établit un nouveau standard en matière de luxe et de design. Dès votre arrivée, vous remarquerez le grand soin que le personnel d'entretien a pris pour vous garantir un séjour agréable. Chaque lit sera fraîchement préparé avec du linge de maison propre, un jeu de serviettes dans chaque salle de bain et un paquet de départ contenant quelques articles dont vous aurez besoin pendant votre séjour. Si vous avez besoin de faire la lessive pendant votre séjour, vous avez la commodité supplémentaire d’une laveuse et d’une sécheuse situées à l’intérieur du condo. Veuillez consulter le lien ci-dessous pour consulter notre FAQ et les informations utiles à apporter. Que ce soit en profitant de votre bain à remous privé avec vue sur le golfe ou en descendant la rivière, vous vous demandez si vous pouvez prolonger votre séjour. Ménage va nettoyer unité au départ. Although thought we new what we were getting but pictures do not even come close to what we got. Beautiful furnishings, high end appliances, breathtaking views, the condo was set up perfectly. So kid friendly and wonderfully maintained. So relaxing. Will be back. Thank you for your review. We are so glad to hear that you enjoyed your stay at Turquoise Place. The added luxury of the condo and the complex are hard to find anywhere else. We look forward to helping you plan your next relaxing trip to the beach. Turquoise Place 2405C has all the comforts of home with a majestically dreamy view! Beach front sand soft as powder with easy wading. We could see dolphins right off our balcony almost daily minus one rain day! Sunrise’s were amazing from balcony each morning... sunsets needed to be seen elsewhere! Condo is fabulously decorated minus a very few furniture pieces in bedrooms needing updated. We only had one mishap in the first 24hrs with toilets not flushing that was remedied immediately upon calling Liquid Life maintenance! Prompt & courteous! Turquoise Place has gorgeous indoor pools with views to die for! We loved the Sauna and steam room! Workout room has tons of equipment with a killer view of the ocean! We never used the lazy river but saw it! The only thing that was a bummer about turquoise Place is there is no bar/tiki bar that is available in the evening. Building turns into a ghost town after sunset! However, if you jump in your car you have lots of food options/bars available! Just be careful as the police don’t joke around here. They are out in full force right now and we saw cars pulled over left and right every evening! Would we return to Turquoise Place! Without a shadow of a doubt! Location, amenities, sandy beach and a HUGE balcony with hot tub & grill! Perfection! Hi Lenke! We are so happy you had a majestically dreamy vacation with us and appreciate your detailed review of your stay! We sincerely apologize about the issue with the toilets but are glad we could get that fixed for you in a timely fashion. Next time you visit us you have to use the lazy river! It is the best! Our local police do a great job during the spring break season enforcing the city's zero tolerance policy on drinking and driving. We want to be a safe destination for all of our visitors. We look forward to helping you book your next trip to the beach! Thank you, Guest Services Team at Liquid Life Vacation Rentals. Fantastic unit and views, nicely equipped with great cookware and plenty of dishes. Clean and comfortable with plenty of space for your entire crew. If I had a suggestion it would be for better wine glasses (the ones there are very small) as well as some cocktail/martini glasses. Not a complaint at all. Love having the wine cooler as well as the ice machine. I recommend and would stay in this unit again. Additionally, customer service was outstanding, both from Liquid Life and support from Turquoise. I was working during my stay and had internet issues one day. Response times from the Turquoise IT folks was very quick (they were at my door in minutes to replace the router). Liquid Life also was accommodating and responsive. Thank you for your review. We are so glad to hear that you enjoyed your stay! We appreciate the feedback and will pass it on. We look forward to helping you book your next trip to the beach. 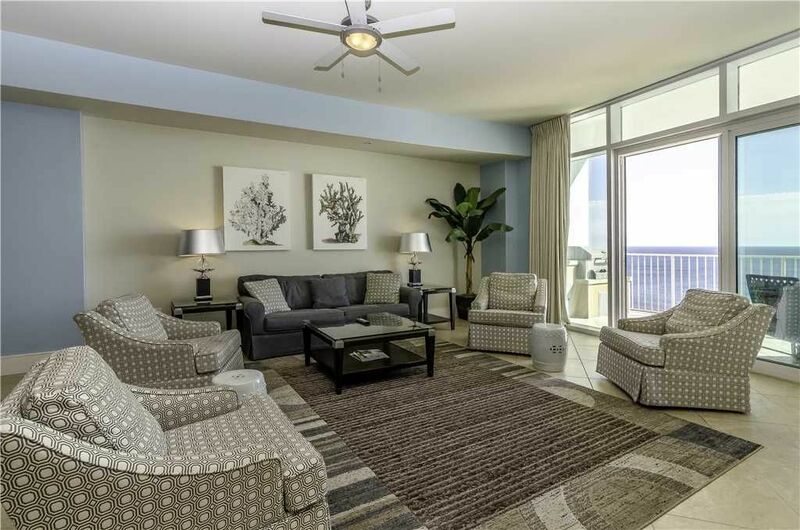 This condo has spectacular views and fabulous amenities. Even the elevators smell divine! We saw dolphins playing in the gulf every morning. Thank you for your review. We are so glad to hear that you enjoyed your stay! It really is amazing when you can catch the dolphins playing in the Gulf. We look forward to helping you book your next trip to the beach. Very comfortable. The unit had everything I needed and then some. Very attractively furnished. The public areas of the property were dreamy. The views from both sides of the property were spectacular. Special touches like fresh flowers and the high level of cleanliness were appreciated. Staff was very courteous and helpful. Parking was easy for this unit and the elevator took us briskly to our floor. Thank you for your service. Thank you for your review. We are so glad to hear that you enjoyed your stay at the Turquoise Place. We look forward to helping you book your next trip to the beach. My sisters and I surprised our mother with a getaway. We enjoyed the condo and LOVED the resort. There were not many there during the entire weekend, so we felt as if we were the only ones there. The weather was warm enough to enjoy the beach during the day, and we really loved the hot tub during the cool nights. The only complaint was that the two king beds are VERY firm and uncomfortable. The two full/queen beds were not as bad. We really enjoyed our stay and hope to get back some day soon! We are happy to hear that you and your sister had an awesome surprise vacation with your mom and had a chance to relax and spend some time together at the lovely Turquoise resort. We apologize that the mattresses were to firm for your taste and will keep that in mind for the future. We would love to have you back for another stay. Let us know how we can assist in any future vacation plans. Turquoise Place est situé à environ 8 miles 6. Est de l'autoroute 59 à Orange Beach, Alabama.